Once upon a time there lived a family. A kind man married A lovely woman and they had two children. Sadly not every happy family can make it forever and so, this family began to fall apart when their two children were in their formidable teenage years. In the early years both children enjoyed a close and loving relationship with both of their parents. However, when the bitterness of divorce began spreading its ugly roots within their once very happy home, the teenage children began to show distain for their father. It was inexplicable the amount of anger and hate these two loving children now held out for their father. On every issue they seemed to solely side with their mother, even the tiniest thing like what to watch on TV or where to go for dinner. If these kids believed that their mother would not like the places or choices, then neither did these teenage children. They would often refuse to spend time with their father, eat dinner with their father, or even watch television with their once cherished dad. 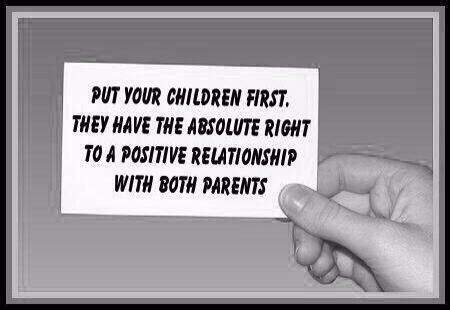 Prior to The failure of the marriage the kids had a close, loving relationship with both of their parents. Now their father was a loathsome creature, not worthy of consideration, care or love. Once the divorce was final, the children completely cut their father out of their lives. They also renounced all ties with their paternal family. As well as daddy’s friends from around town. Heartbroken, he could not understand how children he loved so deeply could turn their back on him in such a way?! How could they forget him on Father’s Day?! His birthday?! pretty much every day? His friends said, “give them time, they will come around you will see” … But they never did, until one day when his worst fear was realized. Yes, he had just learned he had cancer, his time on earth was short. He now reeled in the pain of regret. He was suddenly overwhelmed with regretful sadness of not BEING THERE because of their attitude towards him. Suddenly He regretted as he realized he had a right to attend every birthday, that he had not insisted upon attending even the smallest event even if it meant watching quietly from the back of the room, without drawing undue attention. He regretted missing things like graduation, their first play, their wedding day, and the birth of his grandchildren. He missed it all because he was “Waiting for them to come around”. The pain of his suffering didn’t bode well in his battle against the big “C”. He suffered now not only from cancer but from depression as well. A friend of the family took it upon himself to call his children to tell them it was time. Now as adults, they rallied around him and he was in awe of them. His love for his children left him in tears every night when they left the hospital. He hung on every word they spoke, memorized every story that they told, each memory recalled, or thing they joked about; all the time he had missed “Waiting for Them to Come Around” was now laid before him by two strangers he now knew less about than he knew about his attending nurse. Before his diagnosis he had been seeing a woman and really enjoyed her company. He asked her to marry him just two days before those terrible test results came back, she had agreed, but no date was set due to his diagnosis and the sudden the appearance of his formerly lost children. They seem to permeate every aspect of his now cut short life. They took over and routed her out. He was unable or unwilling to to limit this sudden attention of his adult children in this the final stage of his life. So every day he laid back and memorized everything about his long lost children. All the while forsaking the love of his present. Why should he care about the future? He reasoned for he had no future. It was this sudden, unexpected, and long dreamed about arrival in his present that he was so stunned by that really nothing else mattered to him. Forsaking all others, he simply watched his children as he rapidly faded and died. Because of state laws the actual people in charge of the funeral where his children. Even though they knew nothing of his desires for internment. they had not asked him if he wanted to be buried or cremated, and once again due to his amazement of their sudden appearance in his life, he never mentioned how he wanted his funeral handled. Even if he had told them how he wanted his body handled or how he wanted his estate handled, I’m pretty sure they wouldn’t have cared. He was after all nothing more than a stranger whom they shared genetic code with . They really didn’t remember him from their childhood. He had not attended any important events and didn’t even know their spouses so they thought nothing of having him cremated and throwing his ashes in the middle of a lake. How were they to know that he could not even swim? The next day, the children cleaned out their father’s home . Swiftly, carelessly removing items that were quite obviously items belonging to his fiancé. They placed everything with the state seller who could get rid of all of his stuff within a week and for a nominal fee. Next they hired a real estate agent sold his property and split the money three ways mom and two kids. No one thought about his parents, their paternal family. Sadly they hadn’t seen or cared to hear from their father’s parents, their own grandparents, in years. The grandparents did not get to attend the funeral, did not get to say goodbye to their son, and in fact they never again saw their grandchildren. Sadly, they learned of their sons death by reading an obituary in the newspaper mailed by a friend some 10 days after the funeral. They weren’t really that close to him but they definitely loved him. They always sent their grandchildren birthday, Christmas, and other occasional cards with money inside. They did this despite never receiving A card, a return reply, “Thank You” call or correspondence. Their son wrote to them often but since his divorce had remained aloof. They came back into their father’s life just long enough to benefit from his death; conveniently showing up so that hospital staff and social workers would defer to his kids instead of a truly involved, mother, father, sister, brother, fiancé or other relative for his final wishes. Oh, They came around all right, just not in the way he thought they would. I’m sure, in the mind of an alienated child, this is acceptable and maybe even normal behavior. After all they were taught daddy is a lowlife and he ruined our family so now they’re going to get what they feel they deserve. That concept is One of the most frightening and abhorrent things about Parental Alienation victims behaviors: it is mystifying and wrong in every aspect. No matter if you’re the alienator, the alienated or an adult, untreated, child of acrimonious divorce, you do not comprehend A true family unit or fully understand how families should work, Sadly many of you do you not know at all what real love is like. It isn’t just the children who need help it’s the alienator the ex-spouse, or even someone else involved in the situation such as an in-law or a stepparent if they participate in alienating behavior they need help. The estranged ex-spouse certainly needs help, and don’t ever forget the children because they are our future and if they don’t know how to love this world is in serious trouble.